My downloads folder is duplicated, kind of, and it's slowing down some programs. My phone is a Samsung Galaxy Note 3, using Android 4.4.2. No mods or rooting. I first noticed the problem in image viewer F-Stop which began showing many images as two thumbnails, with different tags, but still the same image. After tracking down the problem I found that my phone now not only has a "download" folder on the internal storage card, but also has a "Download" folder as well. This can be seen in any file manager and even in F-Stop or Gallery when looking at a folder list. Inside each folder is an identical list of files, but I don't think that the files themselves are duplicated. Each time I download a new file, it shows up in both folders, and the same when I remove a file, it is removed from both folders. This hasn't been a big problem except in F-Stop which has become very slow because of having to scan both folders, and the duplicate thumbnails is screwing up my tagging of the files. I don't recall any particular events that happened around the time this problem started so I can't narrow down what program or action might have caused this. I am also afraid for deleting one of the folders in case it ends up deleting all the files with it, or doing anything with any of the image files in case it gets rid of their tags. Any ideas? First it is very common that your SD and your internal memory would both have Download folders. Some times one will appear with a lower case D and one with an upper case, some times. It is unusual though for both to share similar files, downloaded from one file at the same time. In what I've seen anyway. Usually one will get populated when you select it as destination from say a browser, messenger or some texting app, so to be seeing files in both pop-up from one download is odd. Honestly I can't think of why this would be happening... Where are you downloading files from when both folders are populated by the same file? What happens if you download from a different app? So if one download from Chrome ends up in both folders, does one file from your SMS do the same? You also mention that they have different tags. How are you tagging them, in which app are you editing/tagging them? That app seems to only see one folder. 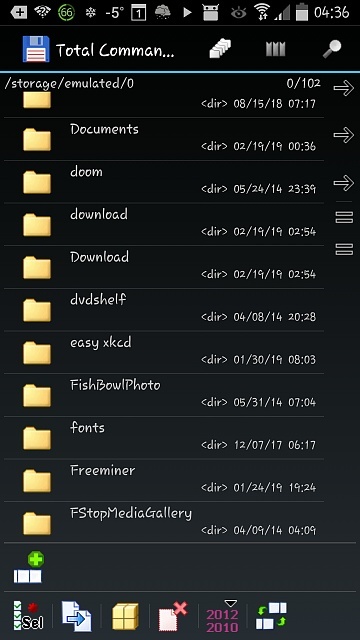 As for your dilemma about deleting one of them and fearing that you will lose content in both, the easy work around for that would be to use your file manager to make a new folder, name it whatever "test", "my docs", whatever, and move the contents of one or both into this folder and delete one. It shouldn't affect the other, but then again this is a strange case. Oops, I guess I wasn't clear. The second download folder that I am referring to is not on my external sd card, which does have it's own, making a total of three such folders, but the one on the external card is not involved in this problem in any way, it contains totally different files. The two apparently duplicated download folders I was describing are both on the internal card, they are part of the same directory listing, one right under the other, when viewed in a file manager. I'll include a pic. That idea of creating a test folder is a good one, I'll give it a try. Well let us know about the test folder. I've never seen anything like this happen in the same directory. Maybe on my first smartphone but not recently. The download folder could be a symlink to the Download folder. Make sure that all the pictures in download are also in Download. If they are, make sure they're all backed up (turning sync on will back them up to Google, or you can back them up to a PC), then delete download. As far as seeing 2 copies, image folders will show all image files on the phone (unless there's a .nomedia file in the folder), so even if download is a symlink, the files in it will show as separate files. my honor 8 lite screen randomly turning off. Is there a way to change the background of the in screen call on a Galaxy Note 9?